One of the most interesting features of Android devices is their versatility. All kinds of applications compatible with smartphones and tablets have been developed and we can configure almost every aspect of our mobile device. Until now, when we talked about a mobile device, we thought only about tablets or mobile phones. However, smart watches are gaining importance and it really looks like they have come to stay. Google has already released its version of Android for “wearables”, ie, watches, bracelets, and other accessories, and we can find the first devices on the market that run this OS. Android Wear will be the common operating system of most smart watches next year, and while it has several unique characteristics, it also includes those features typical of any Android device. In this sense, we have the ability to enable developer options just as we would in any smartphone or tablet. We may also activate the USB debugging mode, which will allow us to install the ADB (Android Debug Bridge). ADB allows us to communicate with the device via PC using console commands. Once we have activated the developer options, we can play with the smart watch and do just about everything we can do with a rooted smartphone. 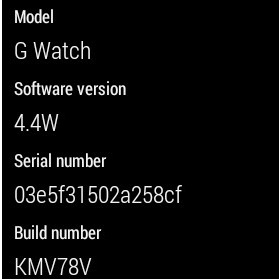 We can unlock the bootloader, root the watch and install one of the ROMs that are already becoming available. To activate the developer options, we have to follow practically the same steps we would do in any other Android device. The first thing consists on accessing to the settings menu. To do that, we need to say “OK, Google” and “Settings” to access to the configuration menu. Once in the settings menu, we have to look for the “About” option and access it. There, we have to search for the “built number” and press repeatedly until a notice appears with the confirmation that we’ve enabled developer options. When you swipe back, we will see that in the “About” menu has appeared a new option, where we can go to access to the developer options. If we enter in that menu, we will see the option to enable the ADB debugging mode. With these simple steps, we can start playing with our smartwatch, we can take screenshots, or try a new ROM (which are actually available!) while developers will hopefully bringing new applications to these devices in a near future.